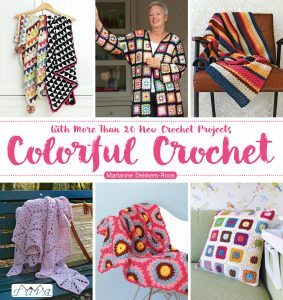 With a Christmas-to-do-list longer than my arm, it was probably not the smartest thing to listen to the crochet voice in my head. 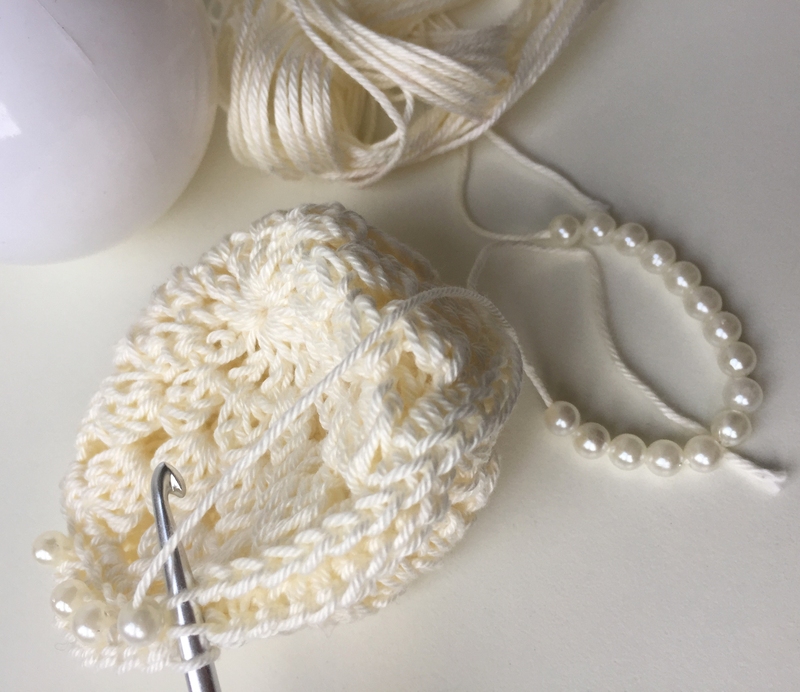 On the other hand, just sitting down with a hook, yarn, some beads and the two ideas that apparently needed to be materialized, was very relaxing too. And when the ideas turned out like I had envisioned: ahh…..such a happy feeling! 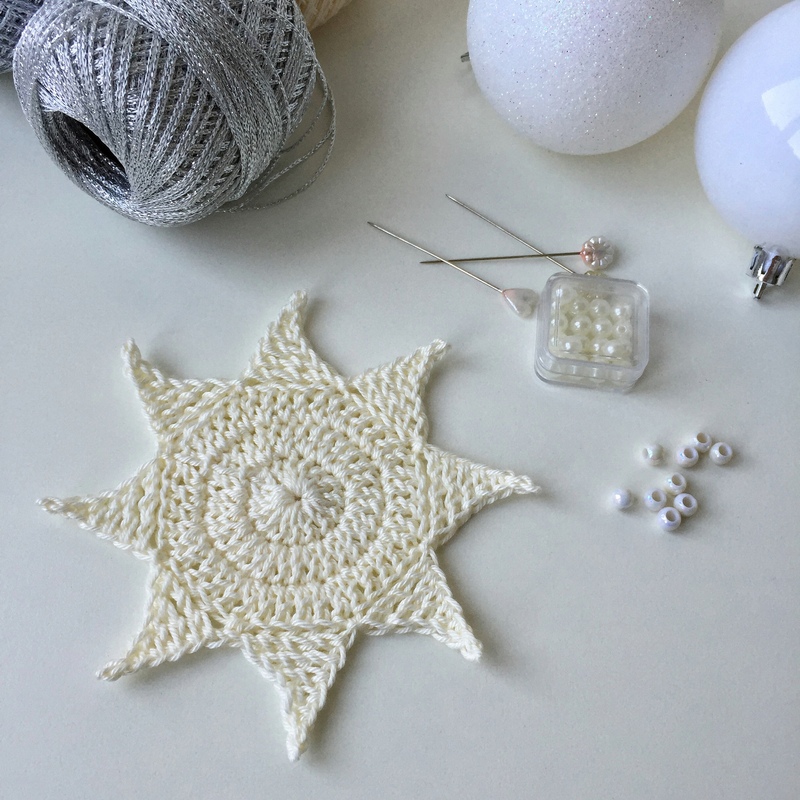 Having shown my stars and beaded baubles on Instagram, I made a promise there to write down the patterns/diy, and here they are. 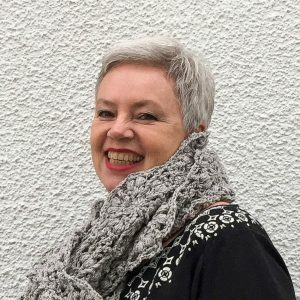 They’re both rather quick projects, so you’ll be able to whip some up, even in time for this year’s Christmas…..
* chain 6, slip stitch in 2nd st from hook, and in every following stitch: sc, hdc, dc, tr; slip stitch in 4th dc from previous round. Repeat 7 more times (8 star points made). 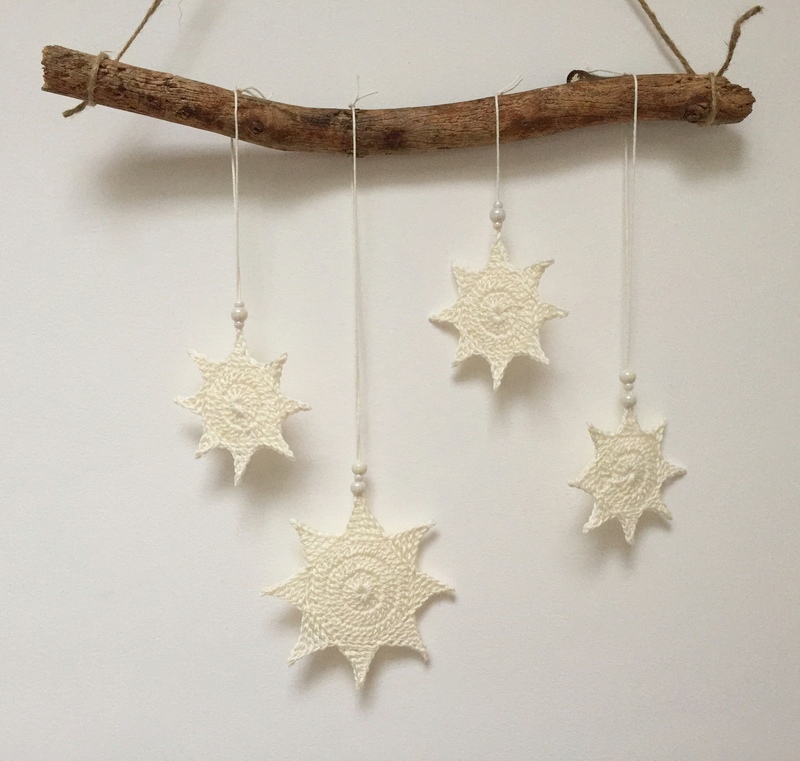 Fasten off, sew in ends; blocking your stars definitely pays off, and you might even want to stiffen them up a little by adhering some Mod Podge. * chain 7, slip stitch in 2nd st from hook, and in every following stitch: sc, hdc, dc, tr dtr; slip stitch in 5th dc from previous round. Repeat 7 more times (8 star points made). Crochet 2 circles like you would for the small or big stars; with wrong sides facing, crochet them together: 1 sc in every stitch, no increases made. With a small opening left, fill your circle with a little fiber fill, close circle. 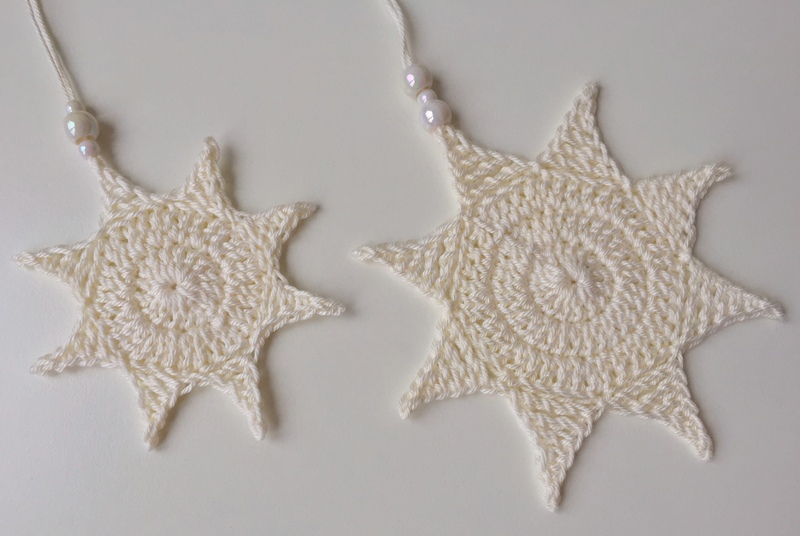 Pick up the part of the pattern to make the star points and ta-dah: 3D star made! 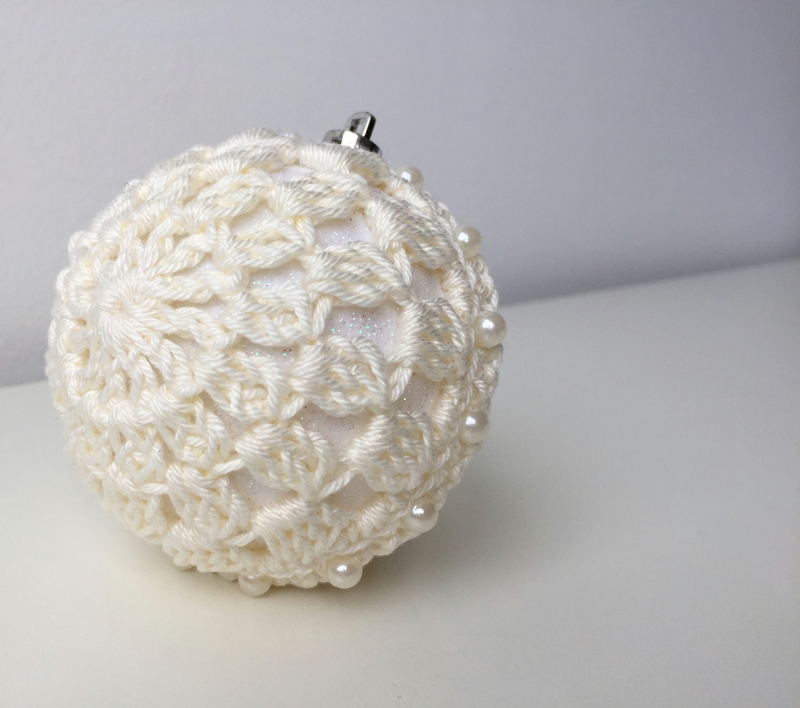 I’ve used plastic Christmas balls for mine, but you can easily use styrofoam balls as well. 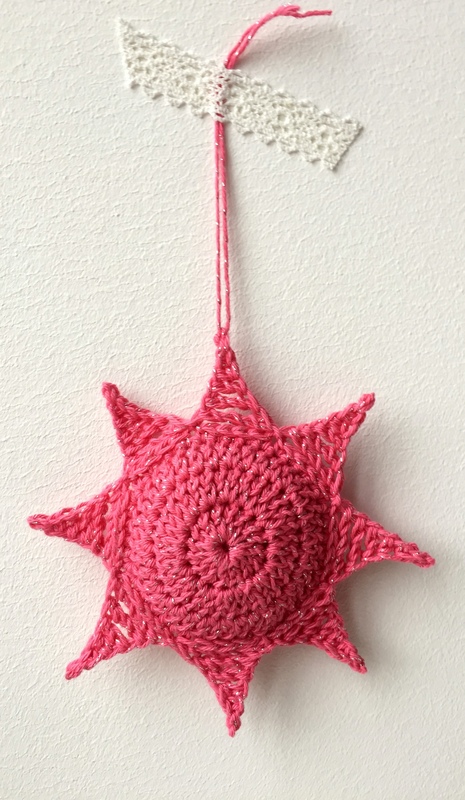 My balls were about 9 inches in circumference (ca 22 cm), and I crocheted with 100% cotton and hook size 3,5 mm. * chain 4 (=1st treble), * 2 trebles in 2-chain space, 1 treble in top stitch of 3-dc cluster from previous round **. * chain 3 (=first dc), 1 dc in every stitch – total of 36 stitches. Fasten off – sew in ends. Make a second one. 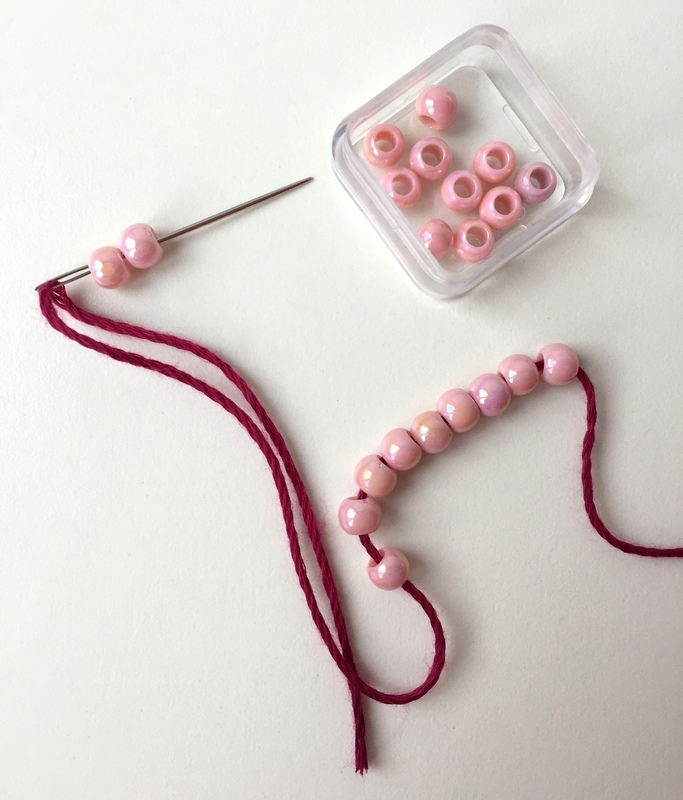 String your beads – 36 if you want one in every stitch, 18 for every other one – onto your yarn. 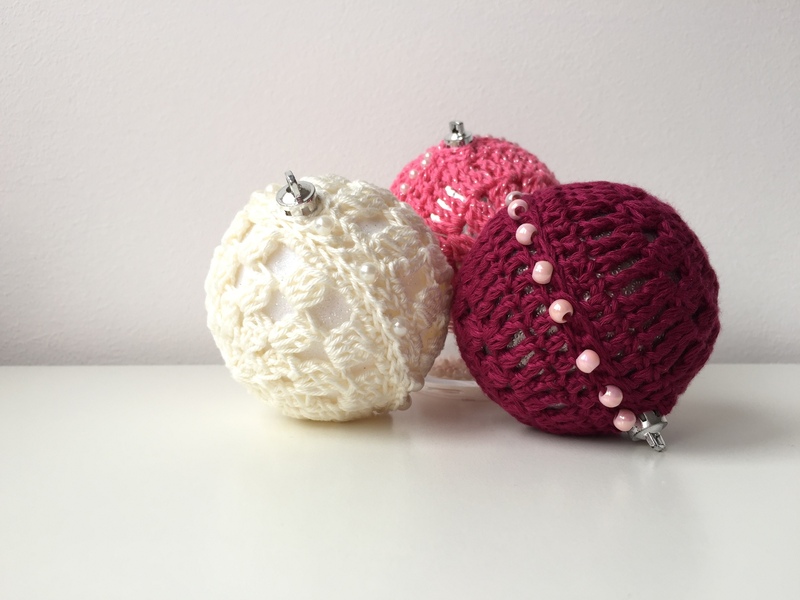 With wrong sides together, start crocheting your half crochet balls together with sc’s, only using the two inner loops (like this tutorial shows you). 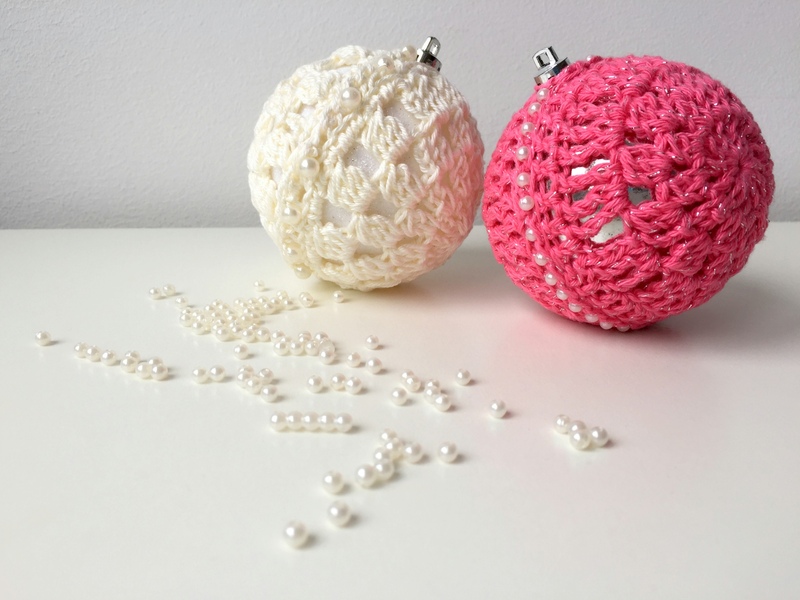 Make sure to slide a bead towards your hook, before you crochet each sc (more info here). 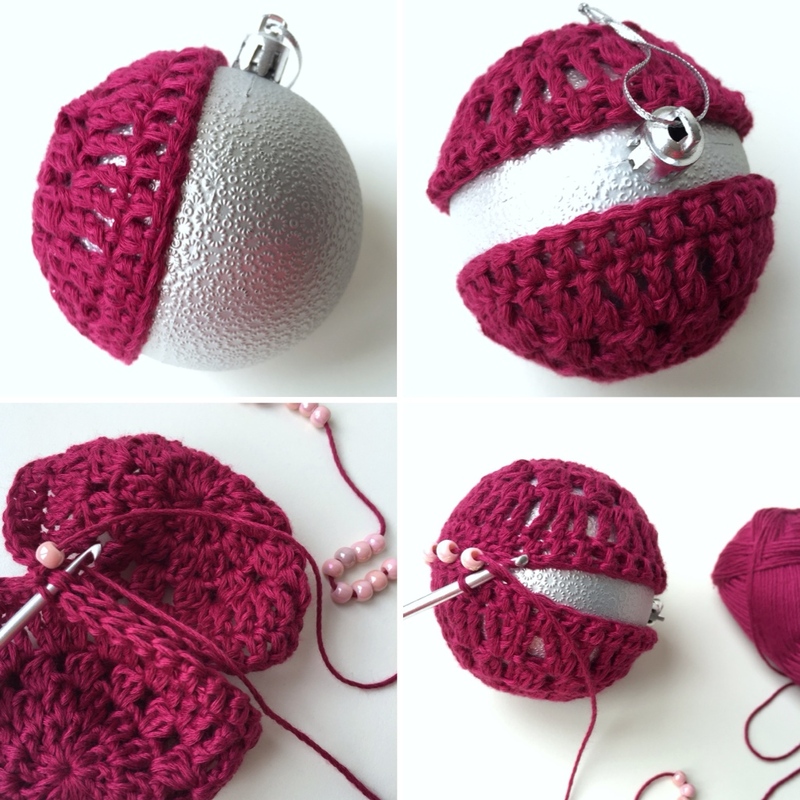 Once you’re 2/3 done, you’ll want to fit your crochet work onto the ball. 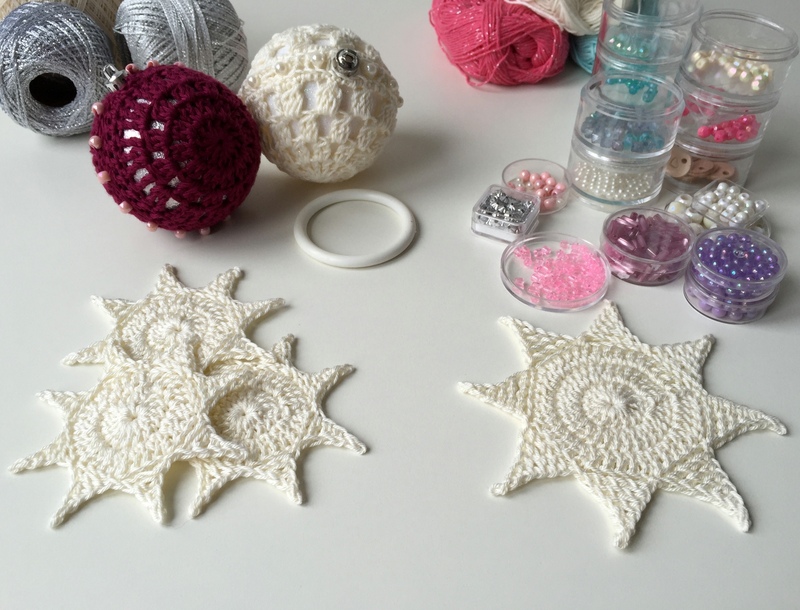 The next part might be a bit fiddly, but you’re going to continue to crochet your work together, adding beads while doing so. Fasten off, sew in ends, and …… admire your work! Always creating something pretty and useful. Thank you for sharing your patterns! Beautiful. These will have to go on my to-do in the New Year list. 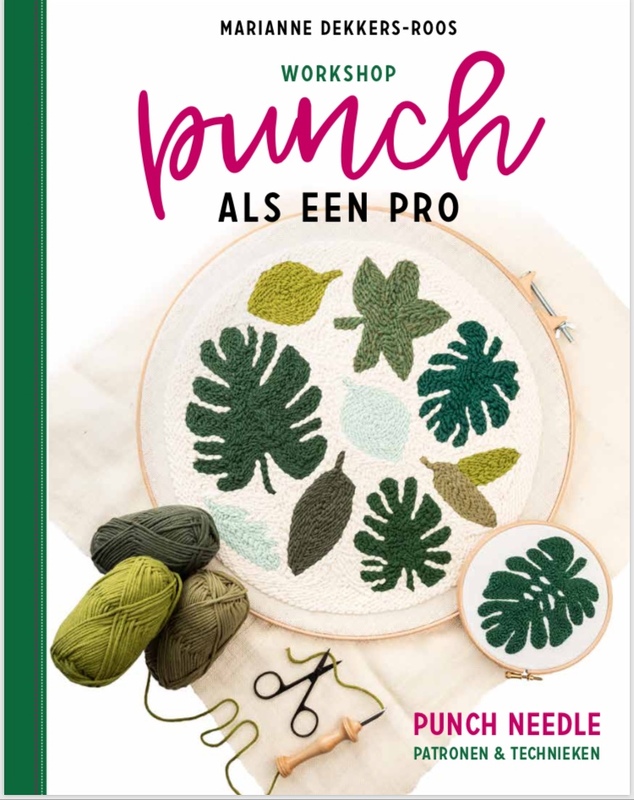 Erg leuk patroontje, duidelijk beschreven. 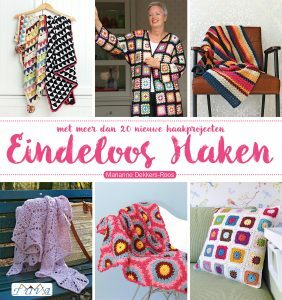 Dankjewel voor het delen. Nu nog op zoek naar passende ballen.